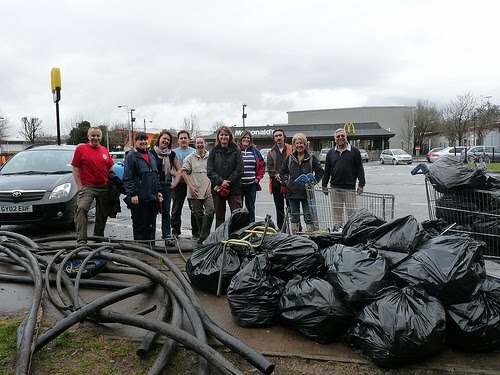 As part of the Tidy Towns Project, volunteers rolled up their sleeves last week to remove rubbish from the woodlands alongside the river Taff upstream of Blackweir. Following the event, the hard working volunteers which included 4 new recruits, were invited into the nearby McDonalds for free refreshments, courtesy of the restaurant manager. Cardiff Rivers Group was formed in 2009 as part of the Tidy Towns project, a partnership between Keep Wales Tidy and Welsh local authorities. Funded by the Welsh Assembly Government it supports the people of Wales to improve the quality of their local environment. The group is delighted to have been awarded a second grant from Keep Wales Tidy of £625. This grant will enable them to purchase tools, equipment and their own stock of lifejackets and waders. Although the group has achieved significant success with tackling litter on the banks and paths next to the river to date, they have had to leave a lot of unsightly waste that has been caught on the low-lying branches on the banks due to its inaccessibility. “The new KWT group insurance scheme is also a fantastic initiative. Our application was quickly approved and we can now carry out our practical activities safe in the knowledge that all volunteers are adequately insured” he added. 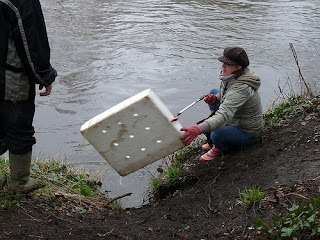 From May 2010, Cardiff Rivers Group will be increasing their activities to 2 events per month to include Sunday activities. The groups’ next event will be on Sat 17th April.